File attachments can be reviewed using Review Board. Some file types, such as images, have special interfaces for doing reviews. For image files, see Reviewing Images. 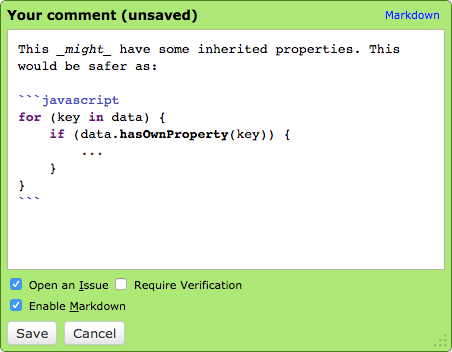 For Markdown files, see Reviewing Markdown Files. For other text files, see Reviewing Text Files. For other files, reviewers can download the files, and add comments to the attachment as a whole. The file attachment box provides a Add Comment button. Clicking this button pops up a comment dialog that works exactly like the dialog you get when reviewing diffs. As of Review Board 1.6.0, there’s no visual indication of an existing comment on the file attachment. However, you can see your comment and edit it by clicking Add Comment again. Every public revision of a file attachment is available for review. The file attachment revision selector allows you to look at previous versions of the change. To browse old revisions, set the handle on the left to No Diff and the handle on the right to the revision you want to look at. The file attachment viewer also allows you to do comparisons between diff revisions (called interdiffs). In other words, it lets you see what changes the developer has made since the previous version of the file you looked at. To view an interdiff between two file attachment revisions, set the two handles to the revisions you want to compare. The behaviour of the file attachment revision selector is the same as the diff revision selector. See Reviewing Diffs for more information. When viewing a file attachment on a review request with multiple attachments, you can quickly jump to the previous or next attachment using the navigation buttons on the sides of the page. Moving the mouse over one of these buttons will slide out a thumbnail giving you a preview of what you’ll see when clicking the button.